Before selecting the sanitary valve, the medium, process conditions and parameters of the control process should be carefully analyzed, sufficient data needs to be collected to understand the system requirements for diaphragm valves, and to determine the type of valve to be used based on the data collected. When choosing a sanitary diaphragm valve, the following aspects can be considered. * The spool shape and structure are mainly considered according to the selected flow characteristics and unbalanced forces. * When the fluid medium is suspension containing the high concentration of wear particles, the valve core, and the valve seat joint surface will be serious friction every time it is closed. Therefore, the flow path of the valve should be smooth and the internal material of the valve should be hard. 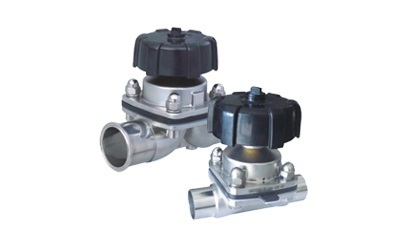 * Due to the corrosive medium, the valve with simple structure should be selected as far as possible if the regulating function can be satisfied. * When the temperature and pressure of the medium are high and the change is significant, valves in which the material of the spool and seat is less subject to temperature and pressure changes need to be selected. * In the actual production process, flash evaporation and cavitation not only affect the calculation of flow coefficient but also form vibration and noise, making the service life of the valve shorter. Therefore, the valve should be selected to prevent flash evaporation and the cavitation valve. * No matter what type of valve, its output force is used to overcome the effectiveness of the load (mainly refers to the unbalanced force and unbalanced torque plus friction, sealing force, gravity and other related forces).Therefore, in order to make the diaphragm valve work normally, the matching actuator to be able to produce enough output force to overcome all kinds of resistance, ensure the high seal and valve open. For double-acting pneumatic, hydraulic, electric actuators, there is generally no reset spring, and the magnitude of the force is independent of its direction. Therefore, the key to select the actuator is to find out the maximum output force and motor torque. For single-acting pneumatic actuators, the output force is related to the opening of the valve, the force on the diaphragm valve will also affect the motion characteristics, so it is required to establish a force balance in the opening range of the entire diaphragm valve.